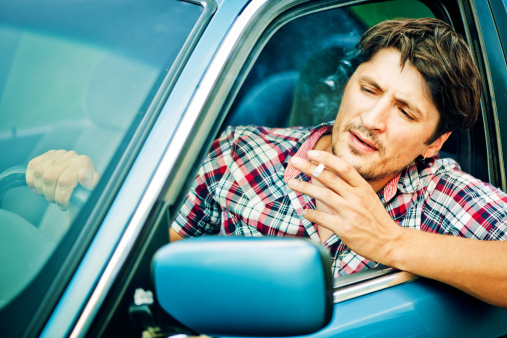 Does Smoking in Your Car Lead to Accidents? Sure, we’ve all heard of a driver who is distracted by his/her cell phone or fighting the temptation not to text a friend back. Many drivers, even you, may have been a distracted driver at least once or twice. Distracted driving is not just a driver using a cellphone, but is any activity that could divert a driver’s attention away from the primary task of driving. All distractions endanger the driver, passengers, and fellow motorists. Such distractions include, eating and drinking, talking to passengers, grooming, reading maps, using a gps, adjusting the radio, talking on the cellphone, texting and smoking cigarettes. Wait. Smoking cigarettes? Think about it. In order to smoke in your car, you need to locate the pack, remove a cigarette, find a lighter, and try to get the cigarette lit while keeping your eyes on the road and hands on the wheel. And what about if your lighting attempts are unsuccessful? You’ll keep trying and your concentration and focus on the road will be broken. Once you’re done with your cigarette, you’ll need to make sure that you’ve put it out properly. If you get a little bit of wind blowing through your windows, you may find a car (and lap) full of burning embers. And don’t even think about littering! Not only is cigarette smoking bad for you and can lead to numerous health problems resulting in death, smoking while driving is dangerous and can increase your likelihood of any preventable injuries. If you must smoke, while in the car, pull over safely. Better yet, ditch the smokes for your health and keep your eyes and hands on the wheel. Be the first to comment on "Does Smoking in Your Car Lead to Accidents?"